Not terribly complicated packaging for the Amazon Echo Dot smart speaker. Very simple to unbox, power up, and prepare it for setup. 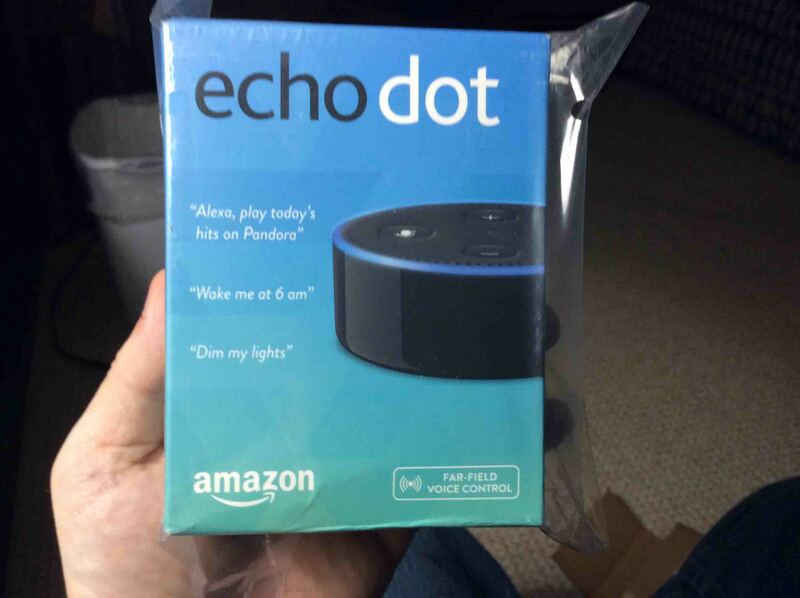 For our vision impaired and blind readers, the Echo Dot comes in a blue box, graduating shades of blue actually, that turns from deep sky blue at the top, to a sort of greenish blue cyan tone at the bottom. Removing the Outer Plastic Bag. Nice that the clear plastic bag is secured shut with easily removed tape. With a little patience, we found that we could tear off the tape gently, without ripping the bag; this, in case we must return the product for any reason. What the Alexa Dot Does. The back of the box, shown in the next photo, has more information. In summary, it says that the Alexa virtual assistant is voice activated, that the Alexa voice service is constantly learning from you using it, how to better understand you, and then it lists some of the things she can do. These include answer questions (trivia et al), reading the latest news headlines, set numerous timers and alarms, and manage all sorts of smart home devices such as thermostats, light bulbs, switched power outlets, and wall light switches. Even more features. The box then mentions that you can connect the Dot to external speakers with an audio patch cable, or pair it with Bluetooth speakers for louder, higher quality sound. You can then hear your favorite streaming services in high fidelity, such as Pandora, TuneIn Radio, iHeart, Spotify, Amazon Music, Amazon Music Unlimited, and others. What is Far Field Communication? On down the back of the box, they define what Far Field Communication is, describing the seven built-in microphones and how this technology enhances Alexa’s ability to understand the questions you ask her. She chooses which mic receives the clearest audio apparently, then she analyzes the audio from that one, to glean the question content. Smart Home Control Features. 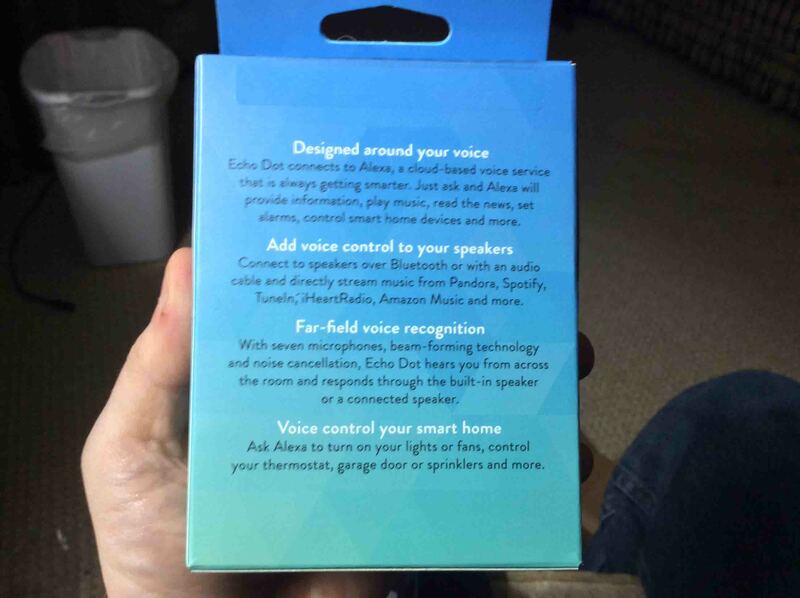 Further down the rear of the package, they mention how Alexa can control your smart home devices, such as automatic garage doors, lights, fans, coffee pots, sprinkler systems, thermostats, … anything that connects to mains power really, a host of smart home devices is available that enable Alexa to manage. 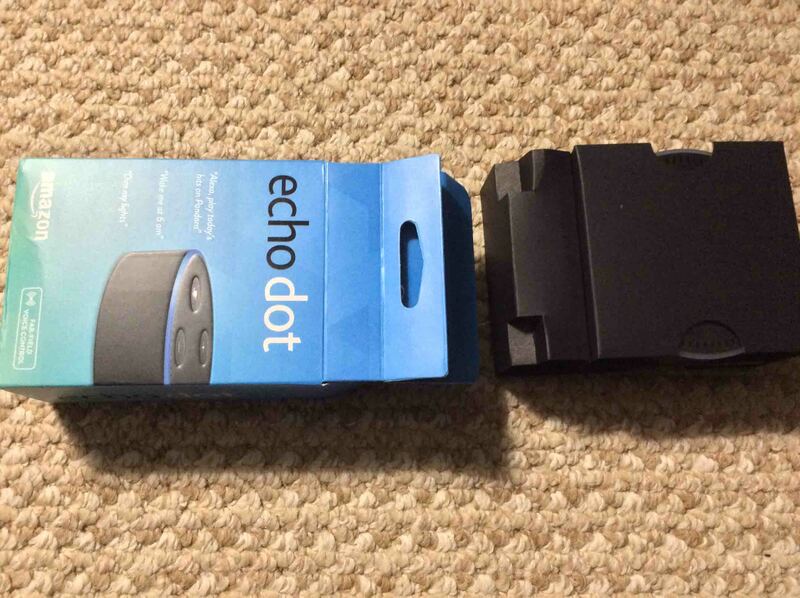 Amazon Echo Dot 2nd Gen speaker, showing the original packaging, back view. The hanging tab. The box is equipped with a tab (or lip) with a hole in the center, on the box top, presumably for hanging on a store display. The box is sealed with a piece of thick tape. Gently peel sealing tape away from top. We removed this tape, careful not to damage the box. You could score it with a sharp knife as well. The presence of this tape, intact, indicates that you probably have a genuine, new, and unopened product. Remove box contents. Then, we opened the box and slid out the cardboard protector that holds the Dot, the power adapter, the USB cable, and the user guides. Shown next. Amazon Echo Dot 2nd Gen Speaker, original package, with inner spacer protector container pulled out. Verify the box contents. 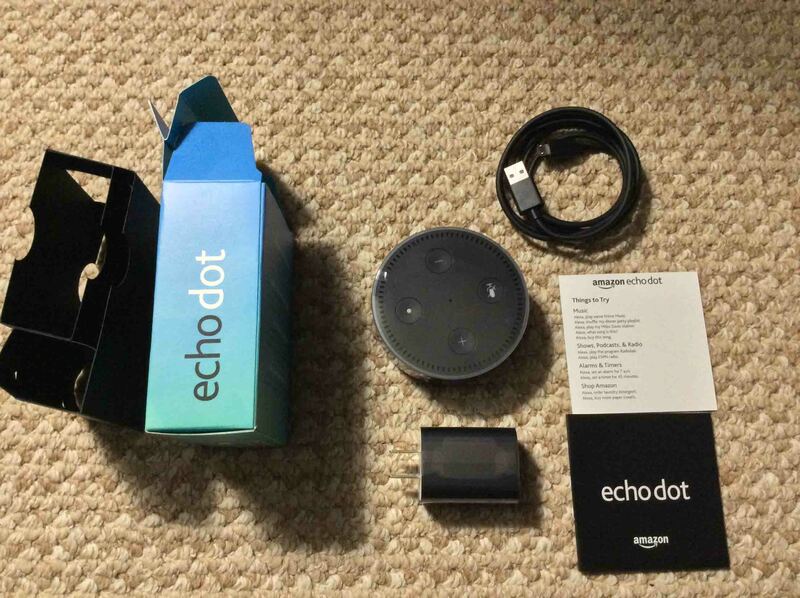 As pictured next, you should find all these items in your Dot box, including the Echo Dot unit, a USB power cable, a USB power adapter, and two mini pamphlets (manuals). Amazon Echo Dot 2nd Gen speaker, original package, with Items inside unpacked. Remove plastic Cellophane from all Dot and adapter surfaces. Like with many shiny plastic surfaced devices, the Echo Dot include protective plastic affixed to its top and sides. So does the USB power adapter. 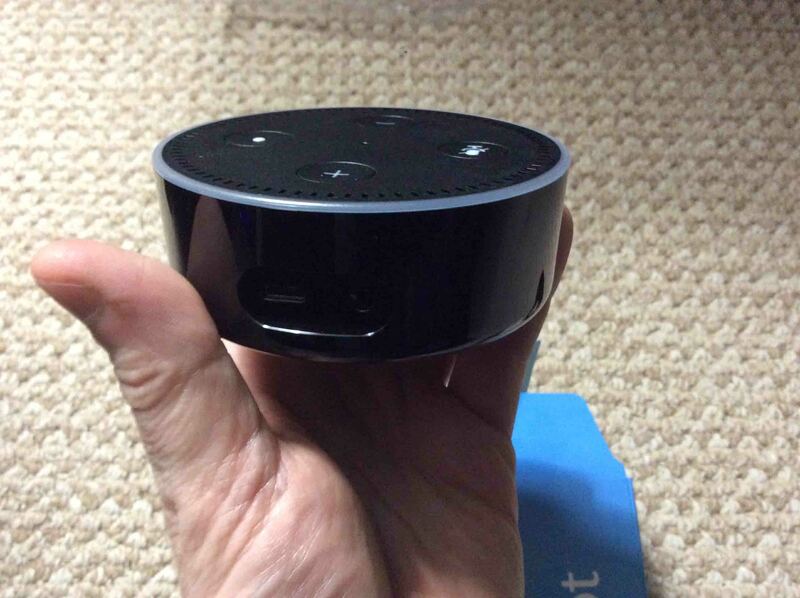 Amazon Echo Dot 2nd Gen Speaker, Out of Box, with protective plastic removed. Ready for plugin. Connect the Dot. 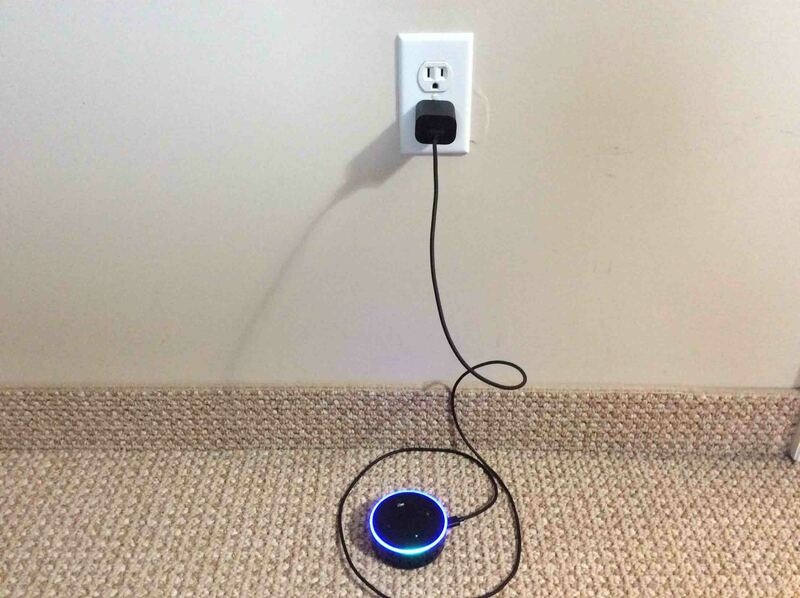 The Echo dot operates from USB power. The necessary cable and USB power pack accessories are provided in the box. Amazon Echo Dot 2nd Gen Speaker, plugged in and booting. Powering up. Connect power cable to the Dot. Connect the micro USB end of the included cable to the Dot. But do not force it. If the plug fails to go in easily, it may be upside down. With the Dot controls facing up, the USB plug should be inserted into the port beside the audio jack, with the two dimple points (the larger side) of the micro USB plug facing down. Best to use the provided cable to guarantee ample current flow. Connect the cable to the included power pack. Then, connect the other end (the A end) (the larger end) of the cable to the power adapter. Plug the adapter into mains power. Next, plug the adapter into a 120-volt AC outlet, as shown in the previous picture. The Dot then boots up. The Echo Dot then boots while its light ring flashes deep blue with a spinning cyan blip. After perhaps twenty or thirty seconds, the light ring turns orange, and the Dot enters setup mode. Follow our setup instructions. We wrote a piece here that details how to connect the Dot to your home Wi-Fi network and then to the Alexa app. Enjoy your new Echo Dot!